That is very pretty. I bet that smells wonderful. 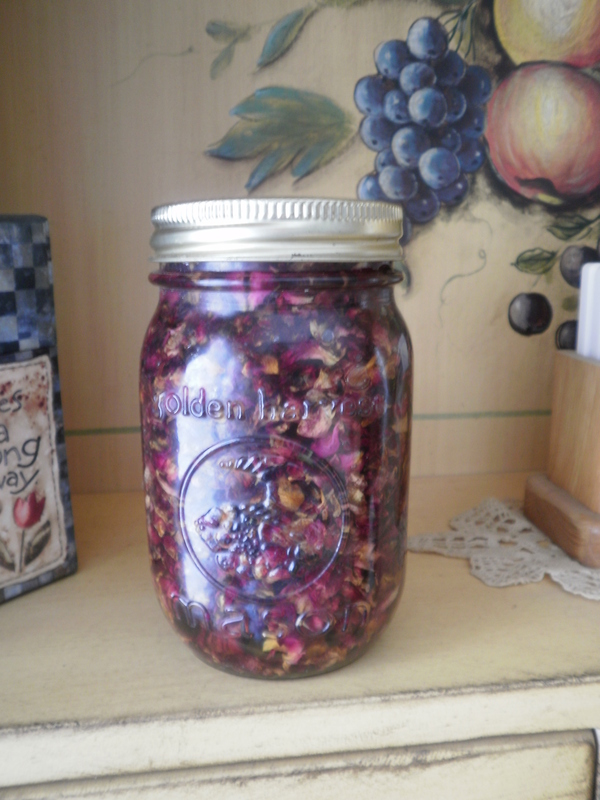 Did you bruise the petals at all before placing them in the jar and covering with oil? Does this macerate have any specific qualities (outside of the olive oil qualities) due to having the rose petals infused in it? I agree, this looks gorgeous and does give the Spring feeling a lift! Very pretty. I had to use dried petals, Alice. The macerate will not have specific qualities, but it will carry some constituent value after it infuses. I may use the olive oil straight, in a product, after the 2 weeks, but I also may add something to help it along (an absolute or essential oil). I will definitely write a follow up post and include your questions! How pretty! I can’t wait to order a soap that has oil infused with Rose Petals. Did you use whole rose petals or dried ones? To be honest, I would keep a jar of this on my desk just because it looks pretty. The jar is sitting on my desk now, Melissa. It will have to go back to a warmer place today. Dried petals were used. I wish I had whole petals on hand right now! I do plan to include it in soap, as well as petals. Thanks, Linda Sue. We need a hint of spring…as I look out the window the snow is blowing sideways (again). Hope your new goat kids are doing well! ‘Mornin’ Mary – I’ll bet that rose oil smells heavenly after it’s finished. Is that where you get “essential oils”? I always thought there was something MORE you could do with rose petals after they wilted a little. I also enjoyed the tutorial on reviving a goat kid. That was so interesting. When we were having puppies years ago, we had a pup that was having a hard time after birth and we had to do some similar stuff to it. It’s a good feeling to know that you helped save a little baby. You didn’t have a puppy? LOL! Most essential oils are derived from the distillation process, from the steam iteself. Others are pressed out of peel, such as a ctirus oil. This (macerate) will not be considered an essential oil. It will be used as a carrier oil, or a base oil with unmeasurable properties from the roses. Mary, will you give us the recipe? Looks easy enough for me to do. You’re so talented! This is easy, Debbie, olive oil and rose petals. When I write a follow up to this post I will give some more examples of what you can do with a macerate, or infusion, and what materials can be used. I am not so talented, I don’t think so, but I do love to learn. Thanks, Amy, I appreciate your thoughts. on February 25, 2010 at 4:17 pm | Reply KathyB. I await a follow-up, and I LOVE rose scented soaps, must have, must have! Okay, will do, will do, Kathy! I can only imagine the scent when you take the lid off that jar! That would also be pretty to use as a potpourri. Put it all in a jar, put a pretty square cloth across the top and a screw band to hold it in place. You could also mix in a strand of lights. When it’s plugged in it will heat up the petals and send the scent to tickle you nose. The jars with potpourri or silk greenery inside, with lights, are very pretty. I like the idea of it scenting the area as well.